I’ve recently received a few requests from my European readers (thank you!) 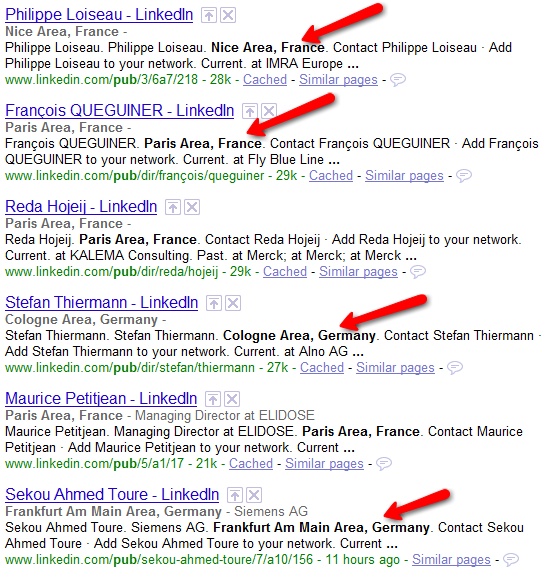 to write about how to use LinkedIn to simultaneously search multiple countries to identify candidates. In this post I will do exactly that – show you how you can search for candidates across multiple countries in one search. 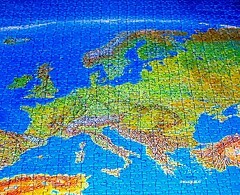 Although I will be using European countries in the examples, the same techniques can be successfully applied to any combination of countries. If it was obvious how to search for people from multiple countries using LinkedIn’s search interface, I likely would not have received requests for help. I’ve personally never run into the need to source from a variety of countries, so I enjoyed taking on the challenge of figuring this out. What I quickly discovered, as I am sure several others have, is that it’s actually impossible to simultaneously search multiple countries using LinkedIn’s search interface – you are limited to one country at a time. While the query executes, you can see that it is not processing the syntax the way that one would think it should. 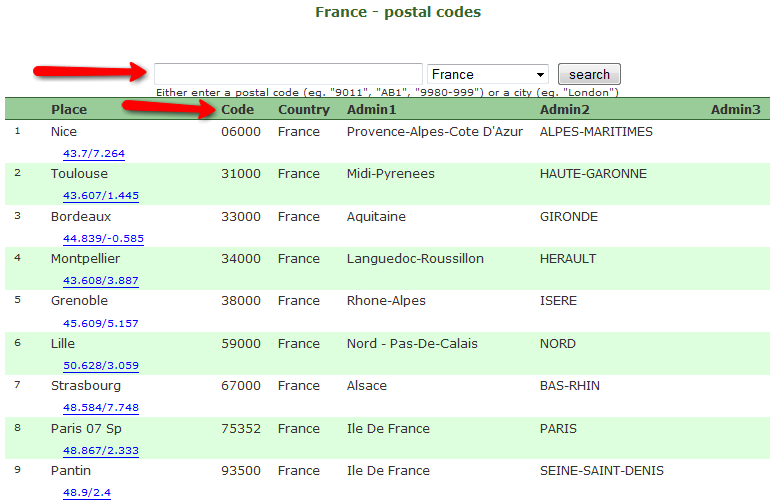 If you explore the results, you will find that all of the results are from France – I could not find any from Germany. I even tried experimenting with quotation marks just to see the effect it would have on the search, changing the query to: (“country:Germany” OR “country:France”). While that does return results, it quite obviously does not work as intended – it pulls results that include people from the U.S., Luxembourg, Canada, and Pakistan. However, I do want to take this opportunity to show you something you may not have realized before – you can search an entire country with a single search. There is no need to actually enter in a postal code and limit yourself to a maximum of 100 miles/160 kilometers. 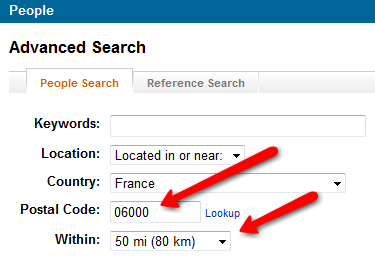 If you leave the postal code blank, you will effectively search the entire country. Here we can see that there are a total of 465,084 people living in Germany who have created a LinkedIn profile. If using LinkedIn’s search interface doesn’t work, our only other option is to use an Internet search engine in an attempt to find profiles of people across multiple countries at the same time. In order to do this, you’ll have to do a little (or a lot, depending on the countries involved) research to find out what LinkedIn’s verbiage is for each major metropolitan area in the countries you’d like to search. Once you have the codes that cover all of the major metropolitan areas for your country, you’ll need to plug them into LinkedIn’s search and examine results to find LinkedIn’s exact verbiage for each metro area. For example, let’s take a look at Nice (06000) and Paris (75352) to demonstrate how this is done. Running the search, we can view a result and make note of the exact phrase that is listed on profiles of people on LinkedIn who live in the Nice area of France. 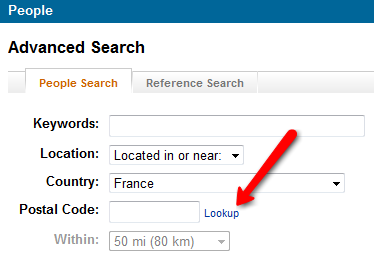 Doing the same thing using the Paris postal code, we find that LinkedIn’s location verbiage for Paris. So far, it’s looking as if LinkedIn’s location verbiage for areas in Europe (CITY Area, COUNTRY) is more consistent than those of U.S. metro areas, whose formats can vary widely (much to many a sourcer’s chagrin!). Important Note about Quotation Marks! While it’s great that our search strategy worked and enabled us to search for people from 4 metro areas across 2 countries, Google limits you to 32 search terms in a query. Once you start adding search terms to your query and throwing in location phrases for a large number of countries, you’re sure to run out of space in some instances. 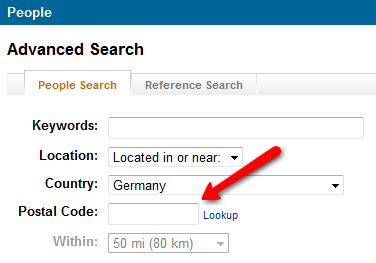 So I decided to see if I could get away with shortening those location phrases for LinkedIn down to “Area, France” and “Area, Germany” to see if I could effectively search an entire country with a single phrase, without having to search each major metro area. I decided to take this experiment a little further and choose 2 more European countries. 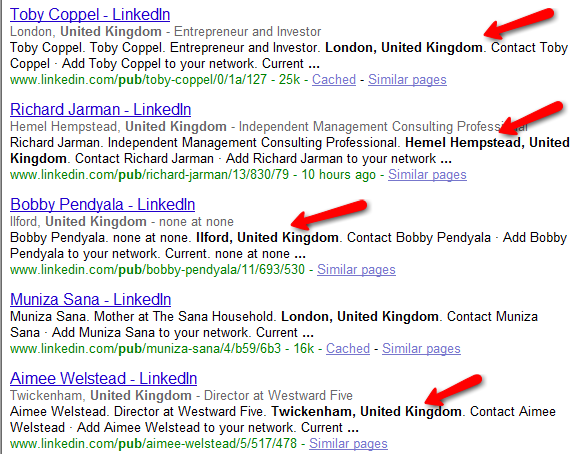 I used LinkedIn to look up a postal code for Kensington in the United Kingdom (W8), and Zurich in Switzerland (8001). Here I ran into my first deviation of the “CITY Area, COUNTRY” format we found to be consistent across France and Germany. For the different locations in the U.K., I noticed the format changed to “CITY, United Kingdom.” However, Switzerland appears to bide by the “CITY Area, COUNTRY” format, as I uncovered “Zürich Area, Switzerland,” and “Basel Area, Switzerland” when I ran a search for 50 miles/80 kilometers from postal code 8001. While adding “Area, Switzerland” to an X-Ray search should find people from all areas of Switzerland on LinkedIn, we cannot accomplish the same thing with LinkedIn’s location verbiage for the United Kingdom. However, we can try using Google’s asterisk wildcard query modifier, which represents one or more words. Let’s give it a shot by itself before adding it to an OR statement to X-Ray LinkedIn across 4 countries. I took a random sample of results from pages 1 through 10 and found a high degree of relevance – profiles of people from various areas across the United Kingdom – and relatively few false positives. I also experimented with using 2 asterisks (e.g., “* *, United Kingdom”) and it returned fewer results (2M vs 3M), but appeared to work equally as well in terms of relevance. If you want to search beyond specific areas of countries and search entire countries instead, you can simply modify your site:linkedin.com to the appropriate country. As of 6/1/10, there are apparently 98 country-specific LinkedIn domains (the United States doesn’t get one) – click here to view the list. To search all of the U.K., for example, you would simply use site:uk.linkedin.com with the rest of your standard X-Ray search syntax/criteria. 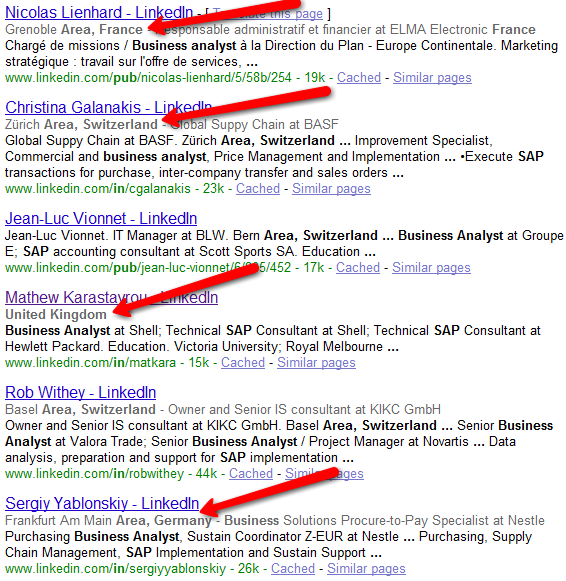 While LinkedIn does not offer the ability to search for profiles across multiple countries with a single query, we’ve proven that you can accomplish this feat through the creative application of the X-Ray search technique and Google. If you are in need of searching a large number of countries concurrently, you will have to invest time to perform the necessary research to uncover LinkedIn’s specific location verbiage for each country. The good news is, you’ll only have to do this once, presuming you save your findings. 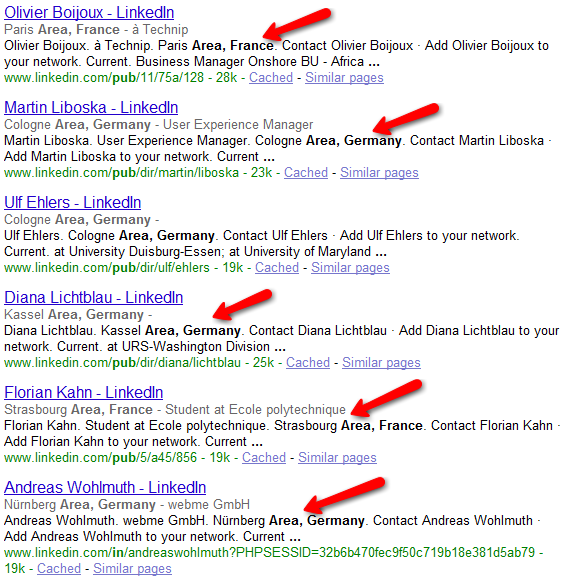 It’s convenient that LinkedIn’s location phrases for a number of European countries appears to be consistent in format, making it especially easy to exploit for effective and concise multi-country searching. It’s also nice to know that through the use of Google’s asterisk wildcard operator, we can also search entire countries that don’t share a similar location verbiage format. However, whenever you employ a wildcard operator, especially Google’s (which can represent 1 or more words), you must be aware that there is a greater risk for returning false positives. When I was inspecting random samples from the results, I did come across a few false positives where the phrase “United Kingdom” was present yet it was not in reference to someone who actually currently lives in the U.K.. Thankfully, I found those to be few and far between. Thank you for reading my blog, and I hope you found this article helpful. I like to hear from my readers – so if there is a particular challenge you’re facing with your e-sourcing efforts, let me know. I just might be able to put together a post to help you and others who are facing the same struggle.